Hi everyone! Have we ever told you how much we love fan art? We love it! A LOT! Check out these great artworks made by Silent Age fans from all over the world! This portrait of Joe is made by Menno Wittenbrood, a Dutch artist whose style reminds me of some of the European comic book heroes I grew up with – like Moebius, Cosey and Derib. US based artist Exleston made this awesome picture of Joe, seemingly jumping between past and future. The picture is called “Paradoxigm”, which I guess is a mysterious mix of ‘paradox’ and ‘paradigm’. 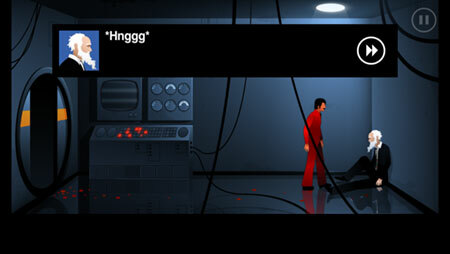 Jón Kristinsson from Copenhagen made this interpretation of an early dramatic scene in The Silent Age. Jón is apparently making a book with illustrations from point-and-click adventures. Sounds like a book I’d buy! French game art student Clara Soro-Bablet made this image, which she has labelled “A student work in the Silent Age’s style“. Apart from perfectly capturing the tone and palette of the game, the image features various objects from the game, like the lockers from the police station and the fake Mondrian painting from Chapter 3. Our personal favourite piece of fan art is in this wonderful handwritten letter from Isaac from UK. Isaac has some fun ideas for alternative outfits for Joe, including a rain outfit, a pyjamas and a science outfit. Seeing other people’s graphic interpretation of our game is extremely fun for us, so if you feel like making a piece of fan art, we’d love to see it!